Shirts With Random Triangles: Texas A&M adds four-star all purpose back prospect Isaiah Spiller to its 2019 football recruiting class. 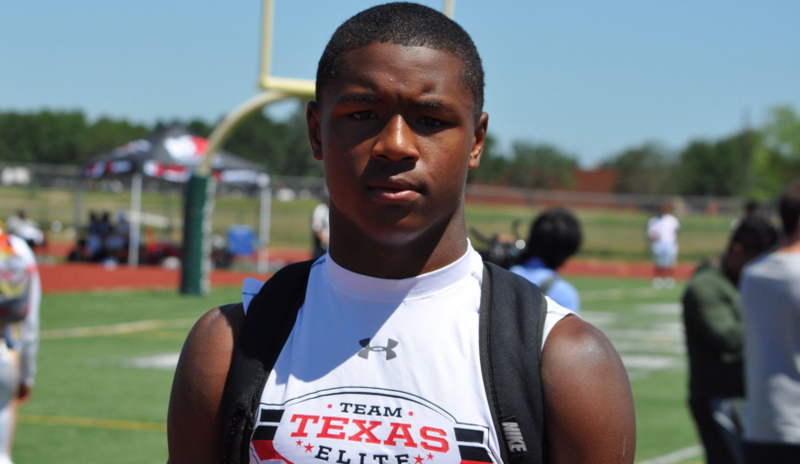 Texas A&M adds four-star all purpose back prospect Isaiah Spiller to its 2019 football recruiting class. Isaiah Spiller. Image via Pistols Firing. Texas A&M has added its 22nd prospect to its 2019 football recruiting class, and it’s one with a legacy with the Aggie program. Spring, Tx. rising high school senior running back Isaiah Spiller announced his commitment to the Aggies on Friday. Spiller is the son of former Texas A&M tight end Fred Spiller. Spiller was a member of the Aggies football team from 1999 to 2001, when back injuries forced him to end his football career. 247Sports grades Spiller as a composite four-star all purpose back. The recruiting site’s composite prospect rankings for 2019 ranks Spiller at no. 2 APB prospects, at no. 28 among prospects from the state of Texas, and at no. 200 nationally. Spiller attends Klein Collins High School in Spring, Tx. He stands 6’0.5, and weighs 201 lbs.